1. Symbol is defined as: something that stands for or suggests something else; a visible sign of something invisible (the lion is a symbol of courage) What does the donkey symbolize in this cartoon? 2. 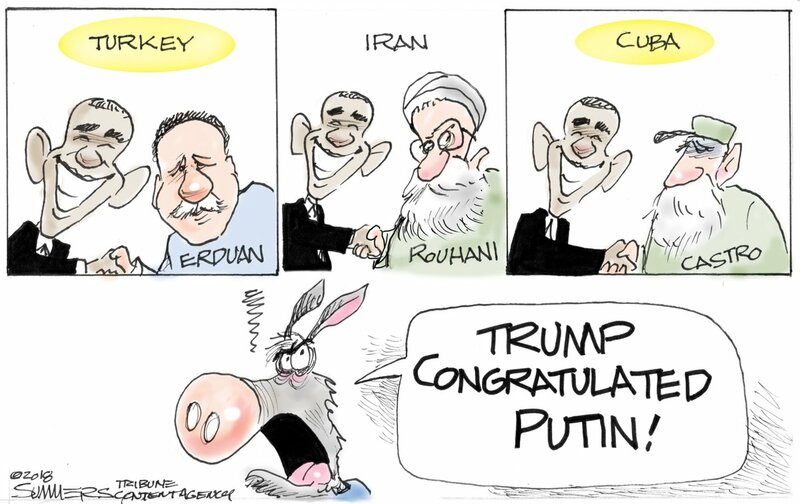 The news media had the same critical reaction to Trump’s call to Putin as the donkey in the cartoon. What is cartoonist Dana Summers pointing out in this cartoon? 3. There are accusations of widespread ballot stuffing in the Russian election, with video emerging appearing to show people actually cramming ballots into boxes at polling stations. Putin won with 77 percent of the vote. Trump noted that President Obama also called to congratulate Putin after his 2012 election victory and said it is a “good thing” for the U.S. to have good relations with Russia. What do you think? Explain your answer. 1. The donkey is the symbol of the Democratic party; in this cartoon the donkey represents the Democrats in Congress and in the media.